World Health Day is an annual event that focuses on a specific health issue to create awareness around the world. On April 7th, millions of people participate in activities to educate and inform others about the chosen issue and share resources that help others. World Health Day 2017 will focus on depression, a mental health condition that affects people all over the world. 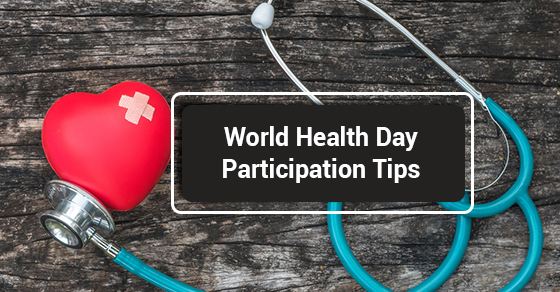 The following are 5 ways you can participate in this year’s World Health Day. Create a World Health Day 2017 team Whether at work, school, or home, getting others involved is the easiest way to spread awareness about World Health Day and depression. Forming a team makes it easy to plan events or perform outreach activities. Consider your co-workers, friends, and family members. If you participate in any meetup groups, think about who might want to be part of your World Health Day team. Find volunteers Any events that you and your team organize will need as much help as it can get. Volunteering gives others an opportunity to take part in World Health Day and connect with like-minded health advocates. Designate a volunteer recruitment leader on your team to find and direct anyone who wants to take part in your initiatives. Reach out to your communities Contacting your community is easy. Social media and other platforms have made it easier than ever to send a message to your personal and professional networks. Use these platforms to share your plans for World Health Day and find others who are also participating. You can ask for ideas or feedback on your events and activities. This lets you find new ways to participate and can enhance the results of your efforts. In addition to your personal networks, you can contact your local media, businesses, and schools. Many of these organizations are already aware of World Health Day and are eager to work with others to create events that attract an audience. Find a World Health Day venue The location for any events you create should be reserved in advance. Community centers, public parks, and other areas are ideal for World Health Day events. But you must plan ahead to ensure that your preferred space is available for when you want. Also, if you have any sponsors or vendors who will participate, you should provide the information and resources they need to take part in your event. Food, music, and other elements can be included to create a memorable experience for everyone. Share your story If you or someone you know has suffered from depression in the past, consider how you might offer a personal story that humanizes the issue. Many people are afraid to talk about mental health issues, and if you’re willing to share your own experience, it may inspire others to do the same. Interviews with local media create more visibility for your story and teach others about dealing with depression and other health issues. World Health Day 2017 turns its attention to depression, which affects people from all walks of life. Its effects can be devastating to those who suffer from it, as well as family and friends. These are 5 ways you can participate in World Health Day and do your part in creating global awareness and promote the wellbeing of everyone.